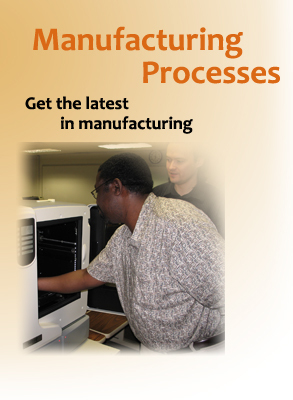 What sort of a job can you get in Manufacturing Processes? A manufacturing process technician is an important part of a manufacturing company’s success because the technician is responsible for many facets of the operation. In college, manufacturing processes courses include CNC, lathe and milling operations, machining operations, Computer Aided Modeling (CAM) and surrounding issues such as materials used in manufacturing. Manufacturing process technicians may inspect and troubleshoot production machinery and read electronic schematics and mechanical drawings or work from written or verbal instructions. He or she may be called in to help plan new process development or make recommendations on the installation of control systems. Black Hawk College Program: Earn a 21-credit certificate, Engineering Technology Fundamentals, or earn a 64-credit Associate in Applied Science degree in Engineering Technology with the Engineering Technology Fundamentals track.